Since mailboxes seem to be a hot topic with me these days, there was something else I found in it that was as completely unexpected as the ONDA/Ruby Conservation Agreement I received last month. It was a letter from Sue Cattoor inviting me to watch Cattoor Livestock Roundups, Inc. remove wild horses in the Red Desert of Wyoming. Her letter spoke of us finding common ground on the subject of wild horse and burro removals, how the services her company performs protected wild horses and burros from dying on drought striken and barren ranges and she offered encouragement for us to begin a dialogue about how to best help the wild horses and burros still left. While I could not accept her invitation to stand witness to more removals of the Red Desert wild horses, I was able to respond to her offer to begin a dialogue about what is REALLY going on in the Wild Horse & Burro Program. Though my response is now a year old, with more wild horses being removed from the Adobe Town/Salt Wells HMA in Wyoming and BLM gearing up to sweep the last of the Moriah herds forever from the range – one of the last legs of the Ely Districts progressive march towards the wild horse and burro cleansing campaign they began so many years back – I couldn’t help but feel my letter to Sue was just as valid today as it was a year ago. It also seems that Sue wasn’t really interested in us beginning a dialogue after all as she never did respond…. Thank you for contacting me regarding wild horse and burro management and removals from public lands performed by your company, Cattoor Livestock Roundups, Inc.
First, I must apologize for taking so long to respond to your gracious invitation to witness “what you do”. I would also like to sincerely thank you for your willingness to open up the lines of communications and exchange ideas regarding the management, protection, and preservation of America’s mustangs and burros. With respect to your invitation to attend the upcoming Wyoming gather, I must politely decline as both the expense and ability to take time off from my job would be impossible to coordinate at this time. However, barring these personal facts, I must say that after spending the last three years studying almost every aspect of public resource management and the BLMs Wild Horse & Burro Program, of which your company is an integral part of, I am gravely concerned about many aspects of the Program. Because of this, I strongly support an immediate moratorium on any further round ups until an independent count of wild horses and burros both on and off the range is conducted. 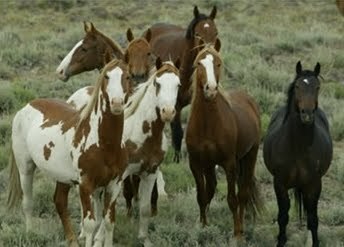 With over 80,000 wild horses and burros removed from public lands in the last eight years as well as the reported 33,000 whose lives are now at stake because of it, I believe the public deserves answers to serious fundamental questions about the Program and what the Department of the Interior has historically done that has brought us to the current sad state of affairs. Regarding your offer to “reach across the aisle”, so to speak, and share ideas on how to improve the Program, I am more than willing to open the lines of communications and exchange information towards that end. With that said, I thought we might first start with one of the most important issues in wild horse & burro management that your letter made reference too. Specifically, the fact that without your services, wild horses and burros can potentially suffer and die on the range due to lack of food and/or water. Let me start off by saying, I understand public resource management is a complicated issue, one that you or your company may only be involved with “after the fact”. The short version is, BLM tells you they need X amount of wild horses and/or burros removed and you show up with the trucks. However, have you ever really spent much time reading or researching how BLM comes up with these decisions? What other things they have authorized, approved of and implemented in these areas you only show up to remove wild horses and burros in? While you and your company may not feel this is within the scope of your contracts, perhaps if you really spent time reviewing what “BLM does”, you may not feel as confident, both from a company point of view as well as that of an American taxpayer, about what you do without getting some answers yourself! As you will see, my concerns are generally focused more on government accountability to the public and some of these issues concern both what your company or others like you, do or have done - but I do not try to argue or deny biological facts. To help give you an example of what I’m talking about, let’s take the emergency gather performed at the Nevada Wild Horse Range during the weekend of July 6-8 in 2007, during some of the hottest days on record in the State of Nevada. At the time, BLM cited these wild horses would have died if water hadn’t been hauled to sustain them. Despite this, water trapping was not utilized – helicopter driving was. In this instance, BLMs choice to drive them via helicopter made no sense whatsoever, either from a humane perspective or that of a taxpayer as the wild horses were already concentrating around the water BLM was hauling to them. Running horses or any animals during some of the hottest days on record was inexcusable, especially so when they had a viable alternative so readily available. Furthermore, the water situation at Nellis is a great example of the “behind the scenes” BLM management that you and your company may not be very aware of. Records indicate for over a decade, BLM knew the few water sources still remaining on the range, the ones that hadn’t been completely fenced off from any wild horse access over the years, had fallen into extreme disrepair. Rather than fix them, they spent all their funding towards round ups and reducing the AMLs to accommodate the continuing decline in water. Did you know that, when BLM reduced the AML of the Nellis wild horses in 2004, water availability was cited as the “key factor” they used to justify this, even though in their calculations they left out over 100 water sources found listed for the area? Between 2004 and 2008, BLM also failed to apply for water rights as they promised they would back in 2004 to help mitigate all the water sources that had been lost over the years. Then in 2008, they lied to the public when they presented their “No Action Alternative” in the new Nellis Wild Horse Range Herd Management Area Plan by omitting the fact that the “No Action Alternative” actually required them to apply for additional water rights and establish wells for the Nellis wild horses. Finally, they also “re-drew” management boundaries that excluded a whole bunch of former water sources wild horses use to use. My guess is they did this so they wouldn’t have to include them in their analysis and this helped them justify issuing lower AMLs. If that wasn’t enough, when BLM was “examining the impacts” of fencing other riparian areas on the Nevada Wild Horse Range, they described cutting off water sources to cattle as “being inhumane and causing them to suffer”. Yet, when it came time to talk about wild horses, they merely said how beneficial this would be to the riparian areas and plants – no mention of inhumane treatment or suffering for wild horses – only cattle! Doesn’t that strike you as a little unfair and indicative of gross prejudice? Here’s another example of on-the-range management going on behind the scenes that you and/or your company may not be aware of. While you may or may not be assigned to this round up, the BLM Ely District in Nevada has recently approved zeroing out almost 1.6 million acres for any future wild horse use on multiple HMAs. Currently, BLM is going through their paperwork process to schedule removals in the coming year. This area has had repeated round ups, sometimes annually, since BLM convinced Congress that a mass wild horse and burro cleansing campaign was necessary. Yet since then, BLM records show livestock authorizations have been continually going up even while wild horse AMLs keep going down and wildlife populations, or at least big game species in the areas, just continue to grow – all in areas BLM claims can no longer support any wild horses at all, despite these other increases. If your company gets assigned the contract to perform the final removals of these herds in the Ely District, will you care that BLM lied, omitted crucial information and just bullied their way through zeroing out the areas and authorizing their final removals? Or will you just scoop them up anyway and send them to holding – knowing what a precarious position that is these days? Has you or your company ever tried to bring attention to BLM about pitfalls you see on the range about what they have authorized, such as the decade long broken water systems in Nellis? Or have you ever considered refusing a job until BLM does the “right thing” to protect the wild horses and/or burros on the range too? According to federal contract records, Cattoor Livestock Roundups, Inc. has received over $12 million dollars since the year 2000 for your services of “Wild Horse & Burro Control”. I don’t believe anyone has made more money than Cattoor Livestock Roundup, Inc. when it comes to on-the-range management of wild horses and burros. Now I realize these next questions may be a bit forward but given the current crisis, I see no reason to tap dance around the issues, as these days, time is of the essence. What I was wondering is, how much you have you given back to these magnificent national icons that have given you and your family so much? Have you sponsored any range improvements such as solar pumps on wells or any other water developments, looked into negotiating with local ranchers to keep the water turned on once the livestock are removed, or perhaps funded fence removals to prevent their entrapment during times of poor range conditions, maybe contributed towards re-seeding programs in areas damaged by wildfires, helped support the adoption program somehow or maybe donated to a local rescue that specializes in wild horses and burros or contributed anything to short or long term holding facilities? The Palomino Valley Holding Facility in Northern Nevada has failed to comply with BLMs own rules about the kinds of facilities required for adopters to adopt a mustang or burro. Specifically, BLMs own rules mandate a certain amount of shade must be provided for protection from the elements before someone can take them home. However, when it comes to their own facilities, BLM has placed this as a bottom priority and during my visit there last year, there was no cover or shade provided anywhere in the large holding pens. Did it ever occur to you and your company to perhaps help sponsor the water developments so desperately needed in Nellis for all those years or to sponsor some shelter for those whom you continually truck in to Palomino Valley? Can you understand what I am driving at? You and your company often express concern about range conditions needing to be able to support wild horses and burros, range conditions that are often degraded due to BLMs or other agencies actions and decisions. Sometimes it’s adding more fencing for more pasture rotations for more livestock or increasing livestock authorizations to such a point that the range is no longer capable of sustaining anything else. Sometimes it’s allowing increases in both habitat and populations for big game that couldn’t normally expand into these areas without a whole lot of help from wildlife agencies (such as guzzlers for bighorn or pronghorn antelope), which in turn places additional stress on wild horse and burro resources too. BLM often fails to examine or report on these impacts all the while citing they “don’t manage wildlife” and therefore, don’t have to acknowledge what is really going on out there with respect to resource competition and the “natural thriving ecological balance” they are lawfully charged with protecting. The only thing they will cite in their environmental assessments is, it is important to remove wild horses and burros to protect wildlife but they never address the issue of these expanding wildlife populations and what may be necessary to protect wild horses and burros or the critical resources they need to survive as well. BLM often authorizes fencing off the majority of springs in an area or critical pieces of land that contain the natural water sources get transferred to “other agencies” that don’t manage for wild horses and burros or maybe were once in the original Herd Area but are removed when BLM drew up the new HMA boundaries; then BLM cites the lack of “natural water sources” in the area to again reduce or remove populations even more. In plans that will shut wild horses and burros out from historical water sources or migratory routes or trap them in livestock depleted pastures after the livestock have been removed, they rarely try to actively explore or pursue sincere alternatives to mitigate the impacts of these proposals. Sometimes plans have been approved that shut them out from what is often the most abundant areas - now fenced for exclusive livestock use while the forage is available and often these exclusions have devastating effects during drought years or during the hottest or coldest parts of the year when they, and all wildlife, need those resources the most to survive. I know we both agree that these are critical issues and I was just wondering what you have personally done to try and help mitigate all the things BLM has approved of over the years that have, and continue to effect healthy populations and habitat with respect to wild horse and burro protection and preservation. Also, there is another question I feel compelled to ask that I would really like an answer to. I have read both in published interviews as well as on your website that you and your husband are active supporters of slaughtering mustangs and burros vs. allowing them to languish in long term holding pens. One of the things I’m scratching my head about is; your recent letter and website often reference Wild Horse Annie’s name as well as her letter of recommendation posted on your website as support for “what you do”. Yet Wild Horse Annie did not support rounding up wild horses and burros for slaughter, government sanctioned or not – it was what she was trying to save them from! She knew it wasn’t just the way they were being rounded up but also what horrible treatment they endured during transport and the kind of death they could expect at the slaughterhouses. How do you reconcile the fact that you only support removals in her name but justify slaughtering them once your services have been performed? The last issue I would like ask you about is; BLMs numbers of the wild horse and burro populations continue to make no sense whatsoever, year after year. They remove them, they tell the public they have reasonably achieved AML and then a few years later, population reports defy any discernable logic as to how they got so large in such a limited amount of time. (Think hundreds of percentage increases!) And these reports just keep coming from the same areas, over and over and over again. How is that possible? BLM has recently been leaning on their inability to accurately census wild herds by a large margin to explain these continuous “population explosion” reports. Yet, I cannot find credible sources that state the historical counting techniques BLM has used over the years are really this inaccurate. In fact, quite the contrary as many people I have talked to with on the ground experience say BLM is pretty darn good at predicting about how many wild horses are out on the range, both before and after the gathers. Based on your long history with the Wild Horse & Burro Program and your own hands on experience, can you provide any feedback on this? Do you agree with BLMs reports, which in essence reflect on your company’s ability to locate wild horses and burros on the range during the gathers, that the methods used over all these years are really completely inaccurate and amount to little more than guesswork by all those involved? Is your company really prone to missing dozens and dozens, if not hundreds of horses, on a consistent basis during the gathers? Again, I would like to thank you for taking the time and making the effort to contact me as well as your invitation to the Wyoming round ups. I am looking forward to your response and continuing dialogues about how best to preserve and protect America’s mustangs and burros and the critical habitat they need to survive. It showed up in my mailbox with no return address. Its title was marked “Confidential”and its contents provided the only explanation necessary. It was a Draft agreement bought for the humble price of $5 million dollars; the price tag put on the final elimination of the wild horses and burros – or what’s left of them - now residing in the Sheldon National Wildlife Refuge and whom had done so for centuries. The executioner will be Secretary Salazar, who will mumble something about the Refuge having another “mission” within the Department of the Interior. He will ignore the facts; that the Wild Free-Roaming Horse and Burro Act charged him with their care on public lands “where presently found”, that the Sheldon wild horses and burros were once protected under the umbrella of the Act until a policy change stripped them of any future protections - and he will ignore the fact that both BLM and US Fish & Wildlife Service have repeatedly stated that “protected” wild horses and burros from BLM managed lands wander in and out of Sheldon. Salazar will hide behind a sea of bureaucracy, despite being named by Congress as the ultimate authority in the protection and preservation of America’s wild horses and burros. And finally, he will claim their blood is not on his hands – that’s what the henchman are for. On May 26, 2010, American Herds posted the fifth in the “Calico: Past, Present & Future” series that outlined how a draft plan between multiple agency’s had been developed and submitted to the owners of the Ruby Pipeline and was to be slid under the table through the deceptive title, “Draft Ruby Pipeline Migratory Bird Conservation Plan”. Approximately $17 million dollars of conservation and mitigation measures were outlined within its pages – though much, much more was planned - with what appeared to be many open-ended “undisclosed” purchases that didn’t needed to be committed to on paper. One of these undisclosed “conservation measures” turned out to be $20 million dollars Ruby would hand out to two environmental organizations who had previously been opposing Ruby’s habitat ripping path; Western Watershed Project (WWP) and Oregon Natural Desert Association (ONDA) as outlined here in the July 26, 2010, article, “Groups Trade Gas Pipeline Approval for $20 Million Conservation Fund”. What else did Ruby’s $20 million dollars buy? Well,it also bought them a new three member Board for each organization from which a Director from Ruby Pipeline would now be entrenched in order to make decisions on how the funds could be spent. One has to wonder, how can Ruby and ONDA’s partnership incorporate funding “the removal and management” of feral horses when supposedly, they have nothing to say about how the DOI and Secretary Salazar handle our public resources. That’s U.S. Fish & Wildlife Services (USFWS) job, right? Right! And that’s exactly what USFWS is doing right now, putting forth three “alternatives” to the public that we can comment on as they move to the next phase of their Comprehensive Conservation Plan for the Sheldon NWR in Planning Update 3. The choices USFWS have crafted? This would allow a maximum of 125 horses and 60 burros to inhabit the Refuge throughout the life of the Plan. Eliminate all horses and burros from the Refuge within 5 years and include the option for sale or auction if other methods of population control are ineffective. Eliminate all horses and burros from the Refuge within 15 years and include the option for sale or auction except more gradual annual population reductions. While Ruby’s PR people are sputtering eloquent quotes about their total lack of involvement in the management and removal of America’s horses and burros and BLM is publishing News Releases calling Ruby’s involvement “a myth”, it will be Ruby’s Director – and Ruby’s cash – that quietly sit in a partnership account waiting behind the scenes. As for ONDA, after the confidential anonymous packet showed up and I could finally scrap my jaw up off the floor, I wrote ONDA’s Executive Director, Brent Fenty to ask him to verify rumors about ONDA making deals with USFWS to remove wild horses and burros from Sheldon. On July 20, 2010, Mr. Fenty kindly wrote back and stated no deals were being made with USFWS and the rumors were completely false. What a relief, huh? Can we call him a liar since I didn’t directly ask him if ONDA made a deal with Ruby instead? After all, what if he actually had some integrity and would tell the truth? While Mr. Fenty shied away from telling the truth about the new Ruby/ONDA partnership deal, he was certainly not shy about expressing ONDA’s position on wild horses and burros inhabiting Sheldon and offered a courtesy copy of the comments ONDA and WWP submitted to USFWS in June 2008 during the last public phase of the planning process. Click Here to view. Welcome to the fabulous world of partnerships, privatization of public resources and the Obama/Salazar vision of “Change”. (and maybe some wandering BLM “managed” horses too)?